REDUCED FAT - 1/3 Less Fat than Kraft Cheddar and Monterey Jack Cheese Cubes. Fat reduced from 10g to 6g per serving. 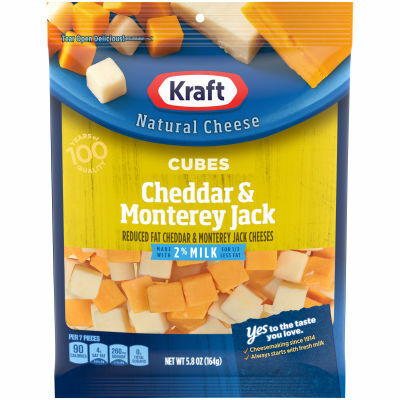 2% Milk Cheddar & Monterey Jack Natural Cheese Cubes - Enjoy two tasty cheeses in one with Kraft 2% Milk Cheddar & Monterey Jack Natural Cheese Cubes. This creamy cheese follows in the Kraft tradition of using only the highest-quality ingredients to create something truly delicious. The rich, smooth texture and delicious taste is sure to win over all of the cheese lovers in your family. It is naturally delicious - crafted with quality 2% milk. Kraft 2% Milk Cheddar & Monterey Jack Natural Cheese Cubes contain 1/3 less fat than our regular cheddar and Monterey cheese cubes. This 5.8 oz bag of cheese cubes brings something special to salads, soups, snack trays and more. Treat yourself and your family to this rich and savory cheese at your next snack or mealtime to taste the difference Kraft can make.